Nathan Callahan / George Bush on Ecstasy. UN Weapons Insepctor Scott Ritter on Caffeine. George Bush on Ecstasy. 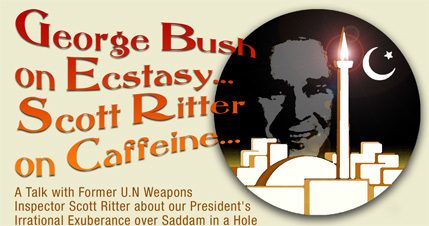 UN Weapons Insepctor Scott Ritter on Caffeine. No matter what you may think about Scott Ritter, this much is true: Unlike our President, Ritter has a noteworthy military record. Ritter was born in 1960 to a military family. Immediately after attending Franklin and Marshall College, he joined the armed forces and worked as a military intelligence officer. Ritter distinguished himself as a ballistic missile expert in the Gulf War under General Norman Schwarzkopf. In 1991, Ritter joined the United Nations weapons inspections team (UNSCOM) and took part in more than 30 inspection missions, 14 of them as chief. He resigned from UNSCOM in 1998, charging that their missions were undermined by infiltration from the CIA and lack of support from Washington and the UN Security Council. Today, Ritter is one of President George Bush’s harshest critics — which is why Mike Kaspar and I dialed his phone number while he was staying at the Sportman’s Lodge in Studio City, California. Ritter agreed to an interview on our KUCI radio show, Weekly Signals. He shot back answers in rapid fire succession, supremely caffeinated in a United States Marine Corps kind of way. How should we view the capture of Saddam Hussein? So what was the war about? “This has always been about the weapons of mass destruction that Hussein’s government was alleged to have possessed and the threat that these weapons posed to the security of the United States. "It was about alleged links between Hussein's Government and Osama bin Laden’s Al Qaeda network. "It was about the danger that these links posed when you bring in the weapons issue — that Saddam could transfer weapons of mass destruction technology to terrorists who could perpetrate an attack on the United States that would make September 11, 2001 pale in comparison. "That’s what this war was about and we now know, nine months into the occupation of Iraq, that the President of the United States mislead the American people and indeed the entire international community about weapons of mass destruction. “George Bush exaggerated information. He misrepresented intelligence date. He fabricated intelligence data. There were no links with Al Qaeda. There were no weapons of mass destruction. So to gloat over the capture of Saddam Hussein and imply that this somehow justifies the entire war is irrational exuberance. “I liken it to a teenager on ecstasy who’s walking around happy but not really knowing why they’re happy. The drug will wear off very soon and that teenager is going to come crashing down to reality. That reality is the quagmire in Iraq — one in which the resistance is not diminishing, but growing. “The president has a political problem on his hands. If he doesn’t find weapons of mass destruction and justify his stated reason for going to war, the American people are going to reflect long and hard about why Americans are continuing to die. Why it is that tens of billions of our tax dollars are being squandered on this disaster in Iraq, while we have projects here at home that could definitely benefit from that money. How would you, Scott Ritter, handle Iraq? “The first thing I would do is stop personalizing this conflict. It’s not about Saddam Hussein. This is about Iraq. Let’s focus on the nation state of Iraq, not on the individual. Now that we’ve depersonalized it, we allow ourselves to break free of what I call the theocracy of evil. When we personalize it and say that this is about an evil dictator, we create a situation where we can postulate that the ends justifies the means. If Hussein is evil, that means that we can lie, cheat and steal to get American forces engaged in combat. “Let’s deal with the hard facts. Does Iraq pose a threat to the United States worthy of war? No. “I would seek to exhaust every venue possible, especially venues that involve inclusion of the United Nations and the framework of international law that the United States committed to when we signed the United Nations charter. That’s the route I would go — the route of international law and multilateral engagement. Not this unilateralism that the Bush administration has undertaken. On the surface, it appears we can get away with it because of our overwhelming force. In the long run, it will lead to disaster. Do we have a consistent Bush foreign policy? “If we started isolating Iraq as humanitarian problem worthy of military intervention how hypocritical are we? What about the Sudan? Where millions of people have died? What about Chechnya where the Russians are carrying out mass deprivations? Are we talking about going to war with the Russians? Are we saying that we need to intervene militarily in North Korea? Do we step in everywhere around the world? “The answer is: of course we don’t. It’s not our job. "So when people come forward now and say that we were justified to go into Iraq because of Hussein and the brutal crimes that he committed, they’re simply putting up a smoke screen to hide their real reasons for intervention. These reasons had nothing to do with Al Qaeda or weapons of mass destruction. “The president stated this in his national security strategy document in September 2002. This is about American unilateralism. It’s about the imposition of an American hegemony on the world. Listen to what Paul Wolfowitz and Donald Rumsfeld told the U.S. senate since the invasion of Iraq: Going into Iraq is the first step in a transformation of the entire middle east to suit those ends. Will we extricate ourselves from Iraq anytime soon? “This is the tragedy of it all. One of the reasons I argued so vociferously against this war was that I knew this was a war we couldn't win. "War is an extension of politics. There is a difference between military victory and winning the war. “We have the best military in the world, but we’re still going to lose this war because we don’t have a solid foundation on which we’re building our presence in Iraq. We got into Iraq on a lie. The international community is not supporting us. The Iraqi community is not supporting us. This is going to collapse. This article originally appeared in the OC Weekly.